Police have issued "no cold caller stickers" to local residents. Lisburn police have urged residents to report cold callers they might think to be rogue traders or peddling goods. A police spokesperson called on local people to report suspicious vehicles, numbers and descriptions of people that they are concerned about. Officers have also been and about in the district issuing “no cold callers” stickers to local residents for their homes. 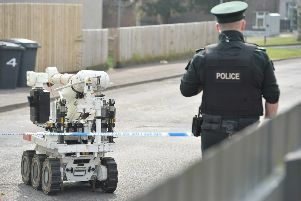 Posting on their Facebook page, Lisburn PSNI said: “Have you or a family member had callers at the door, offering goods or services that you thought might not be quite genuine? It could be anything from property maintenance services, garden work or selling items like knives or pots and pans. “We’re continuing our focus on cold callers across the area and we would encourage you all to call 101 with as much detail as possible about callers at your door to allow us to carry out checks to see whether or not they are genuine. The warning was issued on the same day a man caught peddling goods in Lisburn was being sentenced in Lisburn Magistrates’ Court. Luke Connors (20), of Carnew, Wicklow admitted acting as a peddler without a certificate, on April 19. He also admitted driving without due care and attention and without a licence. The court heard that police received a report of a man going around doors in Lisburn peddling goods including knives, one report was that he was being very forceful. Police received a description of the defendant’s vehicle and he was observed driving through a red light and drove down a one way street. A defending solicitor told the court that the defendant had “come up from the Republic trying to make a few pounds.” District Judge Rosie Watters ordered a conditional discharge for two years in relation to the peddling and disqualified him from driving for three months. She also imposed a fine of £250 for the offences.